Edited by Janie Adams Spahr, Kathryn Poethig, Selisse Berry, and Melinda V. McLain. Chi Rho Press, 1995, Baltimore, MD. Circles drawn by anti-gay, lesbian, and bisexual legislation. Circles drawn by the various Christian denominations’ refusal to ordain “out” gay, lesbian, and bisexual Christians. Circles drawn by the religious right wing to deny, ostracize, and misrepresent the lives of gay, lesbian, and bisexual people, our family, and friends. Circles drawn out of fear and ignorance, hate and prejudice, and myths and stereotypes. We gathered on the steps of the Colorado State Capitol on the frigid first Wednesday night of November 1992. We came together because it seemed the only thing to do. There was no formal announcement about our gathering: the word just spread through the community. Over 7,000 gay, lesbian, and bisexual families and friends stood together to protest the passage of Amendment 2. 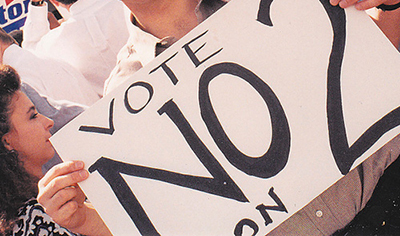 On November 3, 1992, 53.4% of Colorado’s voters passed this initiative sponsored by Colorado for Family Values. This initiative amends the Constitution of the State of Colorado by adding a new section, section 30(b), to Article II in the Colorado Bill of Rights. We came together to say we would not be intimidated by legalized discrimination, to declare to Coloradan and the nation we would fight the injustice of Amendment 2 and to proclaim that we were proud to be gay, lesbian, and bisexual. That night changed my life., no longer could I live my l life as a somewhat closeted lesbian. As I stood there angry, fearful and overwhelmed, I listened to speaker after speaker reassure our gathering that Amendment 2 would be defeated in the court system. I heard warnings about those threats of physical harm. I heard cries of injustice and listened hard for a voice of justice. A voice of justice was spoken, by a gay man who called us to come out, to claim the truth of our lives, and to affirm the goodness of being gay, lesbian, and bisexual. Truth telling is justice. I was being called to tell my truth in the face of mistruths propagated by the supporters of Amendment 2 and the theological right wing within the Presbyterian Church (USA) and other denominations. I was being called to celebrate the God-given gift of being lesbian. I made a commitment to myself and God that I would no longer deny this gift of being lesbian. On election day, only the day before, I experienced rocks thrown at me as a group of us walked the mall with “No on 2” signs, having people literally in my face screaming that my life was evil and I would burn in hell. All in the name of God. I wondered if it would be worth being so visible and outspoken. But I thought Amendment 2 would be defeated and then I could get on with my life again. But I was wrong and my life was radically challenged. I remember the experience of viewing election return and watching out lead dwindle away, shortly after Bill Clinton clinched his Presidential victory; the experience of of holding my favorite PFLAG (Parents, Families, and Friends of Lesbians and Gays) mom as she sobbed; the fear and pain burning in my throat as Bill, Chris, and I walked to my car; sleepless nights and an incessant deep intense wailing within my soul, the experience of wondering what this now meant for those of us who are gay, lesbian, or bisexual. I had gone to bed Tuesday night thinking, “At least there will be some good news tomorrow — at least the General Assembly Permanent Judicial Council will rule in our behalf (in the case of the Rev. jane Adams Spahr’s call to pastor the Downtown United Presbyterian Church in Rochester, New York, and the case in the Synod of Lakes and Prairies to ordain Lisa Larges). At least they will stand boldly for justice.” But then the news that the GA PJC ruled against us in both cases. We had lost. Janie’s call had been set aside and Lisa was denied candidacy status by overwhelming votes. “Too much!” every fiber in my body screamed out at the injustice. Those experiences helped me to see that I could no longer live in the closet. I knew I was lesbian from an early age and spent most of my life denying who God had created me to be. 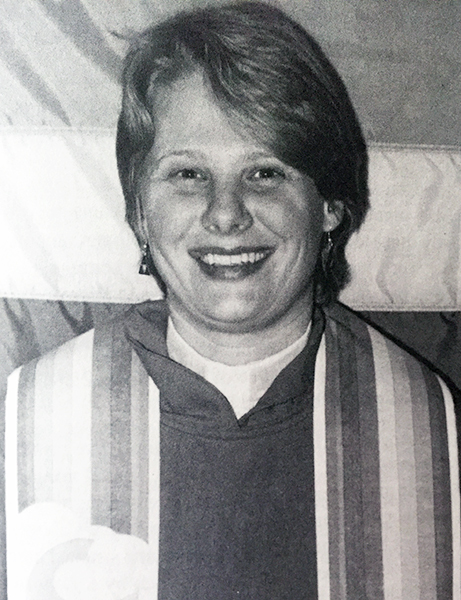 After graduating from Princeton Theological Seminary and moving to Denver, Colorado, in 1987, I began to come out as a lesbian at 27 years old. I had become somewhat comfortable living in the closet. But there were difficult times. Particularly when I was serving a local parish as interim pastor and I felt like I was living two lives. Sure, folks knew that I was a lesbian, but we never talked about it. November 3, 1992, initiated my coming out process. First, there was the Presbytery of Denver Bible study series on homosexuality in February. I went with no intentions of speaking about my personal life., it just didn’t fell like it was the “right time.” But when a man who claimed to be “cured of his homosexuality” stated that gay men and lesbians were innately violent sexual beings and sought to destroy one another for self-gratification, I could no longer be silent. In the midst of 60 clergy and layperson from ultraconservative to liberal churches, I began to tell my truth publicly for the first time. It was an incredible relief to be honest. In March, I cam out to the Session of Montview Boulevard Presbyterian Church where I serve as parish associate. They were fairly supportive. During the Presbytery meeting in May, several churches wanted to withdraw our overture to general Assembly which called for removing the ban on the ordination of openly gay, lesbian, and bisexual people. The Rev. Janie Spahr was a guest presenter and spoke about being lesbian and her call to ministry. As the debate ensued, it became apparent that I needed to speak the truth as a minister of Word and Sacrament active in the life of Denver Presbytery. I reminded folks that I had been in many of their churches: teaching, preaching and celebrating our lives together over the past five and a half years. I reminded the Presbytery that I had experienced support from many of them and how some colleagues withdrew their support and ignored me because they knew I was a lesbian. I told them about the hostile comments, threats, rumors and changed relationships. I challenged them to do the right and just thing and not withdraw our overture. When the vote came, we lost 98 to 95. But a profound victory did occur. It was a victory of truth telling and empowering others to begin their journeys as “out” parents of gay, lesbian, and bisexual children, “out” siblings, and “out” friends. I wish I could say that my “home” church and the Presbyterian Church (USA) have always done the right and just thing. I wish I could say that the proce has not been too high. But the reality is this: it has been the most strenuous and challenging time in my life. I now live with infrequent pulpit supply opportunities, harassing phone calls, rumors about impending ecclesiastical charges, and vicious comments. Yet, I would never go back into the closet. My faith and spirituality have deepened in profound ways. I am learning to live by faith, not fear, and in the freedom of justice. Soon, Amendment 2 will be ruled unconstitutional. A “new thing” (Isaiah 43:19) is taking place in our denominations as we speak the truth of our lives. We are struggling to understand the real meanings of inclusivity and diversity. The spirit is creating a circle of love and justice. Together with God, we co-create a circle which expresses the love and justice of Jesus. May we continue to empower one another with the truth of our lives and thus experience the freedom to fully live as God’s daughters and sons. In 1986, our son, David Bailey Sindt, died of AIDS. 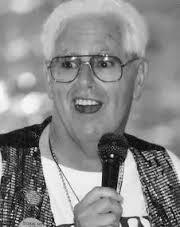 Many anecdotes were shared of his impact on gays and lesbians in the Presbyterian church. A favorite is the time he stood alone at General Assembly holding the sign, “Is Anybody Else Out There Gay?” He was a beacon for so many. David graduated from McCormick Theological Seminary in 165, was ordained and called to the Erie Chapel Presbyterian Church in Chicago. After a second call to Central Presbyterian Church in St. Paul, Minnesota, he returned to school for an MA in Social Work at the University of Michigan. From 1970 until his death he worked in Chicago for the Illinois Department of Children and Family Services. On day, during his time in Michigan, he “dropped in” on us — a long ride for a short visit to Minnesota! Greatly pleased and not a little perplexed, we welcomed him in. Wasting no time, he took a breath and told us that he was a homosexual. We were so ignorant of the matter that I, his mother, responded, “David, I don’t even know what a homosexual is!” After hours of questions and misunderstanding he exclaimed, “But Mother and Pop, I’m still David!” Oh — the light dawned! This was our son whom we loved dearly, and would continue to love. Thus began our education. We read about “homosexuals.” And we learned quickly by experience that these were people misunderstood by many — particularly by our beloved Presbyterian church. In 1972, David started a practice of sending a Christmas letter on his birthday, adorned with symbols he had created. In 1973 he explained how Chicago Presbytery, after ten months of deliberation, refused to accept him to serve in a ministry to gay people at Lincoln Park Presbyterian Church because he was gay. Lincoln Park Church did ask him, however, to develop a ministry within the gay community — but as an outside consultant. The project he really wanted to get underway was a national Gay Caucus of United Presbyterians. 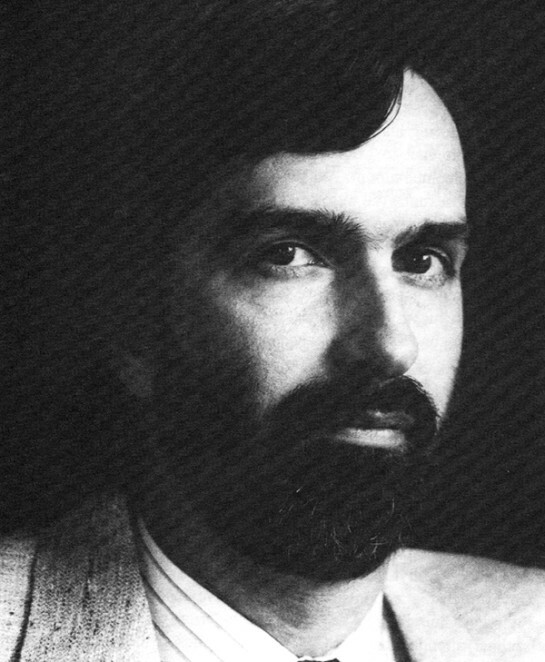 By 1974 David had organized the Presbyterian Gay Caucus, a nationwide venture that extended to both the United Presbyterian Church (USA) and the Presbyterian Church U.S. He, along with others, attended the joint General Assemblies of the two denominations in June, in order to be a “ministry of presence.” Its title soon changed to Presbyterians for Lesbian & Gay Concerns (PLGC). For us, his parents, this publicity pulled us out of our self-inflicted seclusion. Little by little as we read and befriended David’s friends, we came to realize that their mission was to open the minds and hearts of Presbyterians like us. David was still David, doing his best to work for acceptance of all God’s children. As time went on, his advocacy extended beyond the church. He testified before the Chicago City Council’s Judiciary Committee in favor of a bill to extend equal rights to gay people. At the National Conference on Social Welfare, he led a panel on Gay Parents and Gay Children. The paper he presented was picked up by the Associated Press, and stories appeared around the country. In December he attended the International Gay Rights Congress in Edinburgh, Scotland. These prescient words proved true. The following year, the Presbyterian Gay Caucus prepared a report to the United Presbyterian General Assembly which was discussed, debated — and rejected. But through the lengthy discussion in committee and on the floor of the General Assembly, PGC emerged as a player in the national Presbyterian scene. But such attention did not sit well with David’s detractors. Up to this point, David had maintained his ordained status through the Presbytery of the Twin Cities. When for a second time, they granted his request to “Labor outside the bounds of presbytery,” contingent on corresponding permission from the Presbytery of Chicago, the latter first approved, only to rescind it a month later. First, he had lost a local ministry, now he had lost Presbytery membership. His visibility had a great price. Such action was reported in the three Chicago papers, several radio and television shows, and in The Christian Century. In 1975 David also experienced the physical consequences of his orientation. In New York City he sustained head injuries in an anti-gay attack. Fortunately there was no permanent injury, but he was hospitalized with some loss of memory for five days. Perhaps as a way to find beauty amidst such trouble, he began an iris business. As he originated new varieties of the small irises, he was able to distribute and exhibit them. As time went on, he became and authority in the iris world on those types of addresses and won many awards. That brought satisfaction when his pursuit of acceptance by the church faltered. I sadly recall a visit with David at Lincoln Park Church. When the pastor conducted an ordination of a newly elected elder, other ruling elders present were invited to come forward for the “laying on of hands.” As Gus, my husband and I went forward, David remained in the pew. I whispered to David, “You belonged there!” He responded sadly, “I know!” When he was nominated as a Ruling Elder a year later, he was not elected after heated debate. Nonetheless, this confrontation over the ordination of gays galvanized the resolve of David’s proponents. In subsequent years, Lincoln Park Church became a More Light Church. It was in 1980 at the General Assembly in Detroit that David was the first official corresponding member for Presbyterians for Lesbian & Gay Concerns in its seven years of existence, with a voice but no vote on the floor. Meanwhile his responsibilities with Cook County child care licensing grew. He became recognized as on of the most knowledgeable people in foster home licensing in the state. The result was that he was ordered to Springfield to help write licensing procedures for a new computer program. About that he was not too happy! In 1985 health became an issue., and during June, based on symptoms and test results, he was diagnosed with ARC (AIDS Related Complex), a condition related to the impairment of the immune system. It was rewarding that year to have an iris he introduced in 1979, Zipper, win the highest award of the American Iris Society. In David’s Christmas letter for 1985, he told of his plans to spend Christmas with his parents in Minnesota. Those plans were never consummated. On the day he was expected, he called us from a Chicago hospital. He had been diagnosed with AIDS. The next year, General Assembly met in Minneapolis. As David’s parents, we invited members of PLGC to join us at home in Afton, near the banks of the St. Croix River, for Sunday brunch. David was here, beginning to feel the effects of the AIDS from which he was suffering. Other gays, lesbians, and friends responded, to the point where “family” overflowed our facilities — from our home, to the deck, to the yard — wherever they could find space. David Bailey Sindt died December 3, 1986 at his home after several months of diminishing health. When the news was released, friends and family arrived at once. Rodger Wilson, an early organizer of PLGC, came from Texas — needing ear muffs in cold Chicago! Memorial services were held at Lincoln Park Church and in David’s home church in Minnesota. In Chicago, iris friends from Illinois and Indiana joined gay and lesbian Presbyterians. In Minnesota friends of years past gathered, with church leaders who remembered days long before David came out and called out to gay Presbyterians to join him at the General Assembly. In retrospect, we, David’s parents, are eternally grateful for the way David changed our lives. His love has taught us a love that is far greater and includes many we would never have known. We thank God every day of our lives for the life of David and for the privilege of having him as our son. We are so grateful for the outreach he taught that brought us relationships with so many whom we now count as “family” — definitely our loved ones. GUS AND CHAR SINDT, the “Mom and Pop” of PLGC, began their lives together in 1937 in Minneapolis. Gus was reared on a farm in southern Minnesota, a son of German heritage. Char was the daughter and granddaughter of Presbyterian ministers. For more than forty years they have been affiliated with North Presbyterian Church n North St. Paul, Minnesota. Gus was employed at Minnesota Mining and Manufacturing Company, and Char was a housewife. They had two children, David Bailey Sindt and Claire Ann Sindt. The Sindt residence in Minnesota has become “home” for lesbians and gays throughout the country, not only Presbyterians but others as well. We are proud to acknowledge the love that David taught us when he said, “Remember — I’m still David.” It is a love we are proud to share with all members of our “family,” those who acknowledge us as “PLGC Mom” and “PLGC Pop.” Praise be to God! Rev. Howard B. Warren, Jr. In the January 1993 PLGC (Presbyterians for Lesbian and Gay Concerns) More Light Update, one day after the Permanent Judicial Commission of the Presbyterian Church (USA) denied the call of Rev. Jane Adams Spahr and questioned the licensing of Lisa Larges, Chris Glaser, Editor of the publication, commented on the injustice. “It is time to ACT UP,” he wrote. The following is an excerpt from that article, which can be found here. Pray for an epiphany for the church. Howard Warren, the founder of Presbyterian ACT UP! embodies such prayer — in his words and in his actions. That’s why I am dedicating the *More Light Prayer Book 1993* to God in thanksgiving for the life and ministry of the Rev. Howard Warren. His constant theme of “the wildly inclusive Spirit” gave birth to this collection’s focus: *Spirit Prayers*. Howard is director of pastoral care for the Damien Center, an AIDS service center in Indianapolis. HIV-positive himself, he has helped hundreds discover and rediscover their spirituality in the midst of the AIDS crisis. Prior to that, he had served several congregations whose ongoing love for him reveals his own compassionate ministry. Justice movements often find their new leadership in succeeding generations, but Howard is an exception to this rule. I’m a generation in front of him, yet he even made *me* nervous when he determined to lead an action on the floor of the Baltimore Assembly during opening worship! But I felt pride when I saw him there, beneath the podium, holding a sign that said “SHAME!”, anticipating the negative vote on the human sexuality study. No one remembers a word of the sermon preached above him, but anyone who was there remembers the Word embodied in that white-haired gentleman, robed in clerical garb and mystical majesty. Thanks, Howard. We’ve come a long way because of folks like you!